Galion has a colorful and lengthy past. 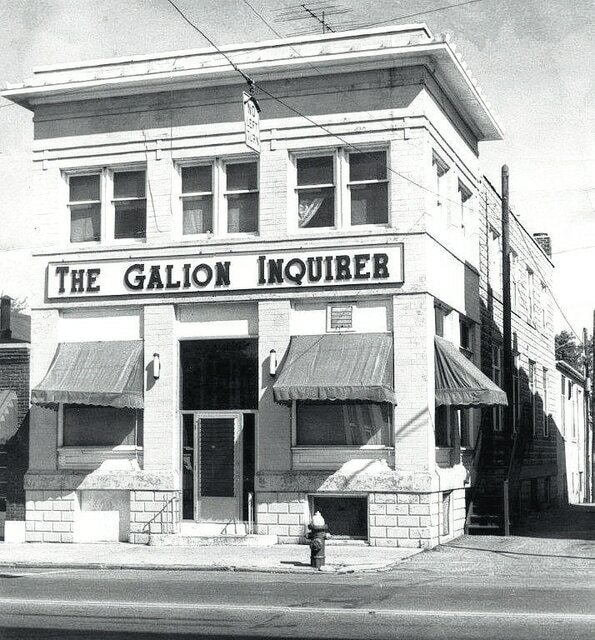 The events noted in this column are taken from the Galion Inquirer archives from years past. The focus will be items of personal or community interest from 10, 25, 50 and 75 years ago. Entertainment Tonight, Jeopardy and That 70s Show were on TV. Galion Historical Society day campers got to ring the loud fire bell on the antique Galion Fire Department steam pumper truck. Pictured blocking their ears were Kearsten Kostelnik, Haley Cochran, Gave Mackeever and Vaughn Papenhausen. Crawford County Park District announced the winners of the Catch and Release Bass Fishing Contest: Todd Flohr and Matt Pickens were the winners at the Lowe Volk Park. Thousands of people gathered at Mansfield’s Lahm Airport to show support for the 179th Air National Guard unit and express their desire to keep the base open. Galion Area Chamber of Commerce Ambassador Lonnie Eagle was pictured serving up hot dogs at the cookout on the square. Judith Ressallat graduated with a Masters in Public Administration from Harvard University’s John F Kennedy School of Government. Connie L Smith of Brandy Road received a Masters Degree in College and University Administration from Michigan State University. Participants in the Great American Bike Adventure (GOBA) visited Galion’s historic landmarks on their trip through town. Included on the tour was the Howard House on South Boston, which normally wasn’t open to the public. Amy Prijatel, Natalie Tyrrell and Raquel Ressallat were pictured on the tennis court practicing their skills during the City Y summer youth recreation program. Marge Sherron was pictured in the dining room of the Rose of Sherron, the bed and breakfast inn that she and her husband were renovating. Little League results included two doubles by Matt Pawsey for Wendy’s in the win over Pizza Hut. Laven North tripled in the game Weather craft won over Geyer Sanitation. Lawson’s advertised milk on sale: Half Gallons of Homogenized for 35 cents, 2 % Skim for 34 cents and Skim for 32 cents. Lawson’s also was open 8 am- 10 pm Seven Days A Week! William Lewis Stultz was promoted to rank of Major in the US Army. His parents were Mr. & Mrs. Emerald Stultz, 530 North Union Street. William’s picture was printed in the Galion newspaper. David and Steve Prim hosted an open house in honor of their parent’s silver wedding anniversary. Mr. and Mrs. Charles Prim were originally married in 1940. Mr. & Mrs. Jean Ballinger observed their 55th wedding anniversary. Contributions to a fund for the building of a new Galion Hospital increased by $6000. Stratbury Manufacturing, Central Ohio Steel Products and Arthur J Freese each donated $2000 towards the cause. Approximately 75 relatives attended the 42nd annual Mary Jane Tracht Family Reunion held at the Crawford County Fairgrounds. William Carmel celebrated his 86th birthday with a family dinner at his son’s home on West Church Street.